Complete Bliss. A scent range which in name alone makes you feel relaxed. The NEOM Complete Bliss Home Candle (Selfridges*, £39.50) has been the perfect scent to relax to over the past week or so, and a scent I'm already pretty familiar with. Last year I reviewed the NEOM Complete Bliss Room Spray (LookFantastic, 100ml, £16) and it's every since trying this scent, that I have been eager to try more from the Complete Bliss range. Just a couple of spritzes of the room spray, which has lasted months and months, leaves our home smelling incredible, and the candle is no different. Made with natural and organic ingredients, NEOM home candles are presented in perfect glass pots, with three wicks and a burn time of up to 50 hours, which is 30% longer than other brands. Because they are made using only Vegetable Wax and Pure Essential Oils, with no synthetic ingredients or fragrances in sight, they burn evenly and clear, with no harmful pollutants, toxins or soot. But it's the scent that makes this candle a real luxurious treat. Complete Bliss is a blend of Moroccan Blush Rose, Black Pepper and Lime, leaving a beautifully sweet, floral yet reviving scent that is incredibly relaxing and soothing. It's the perfect scent to have in the evening, helping you wind down from a busy day. Smitten. The NEOM Complete Bliss candle is also available in travel size (Selfridges, £15), a scent I couldn't recommend trying enough. 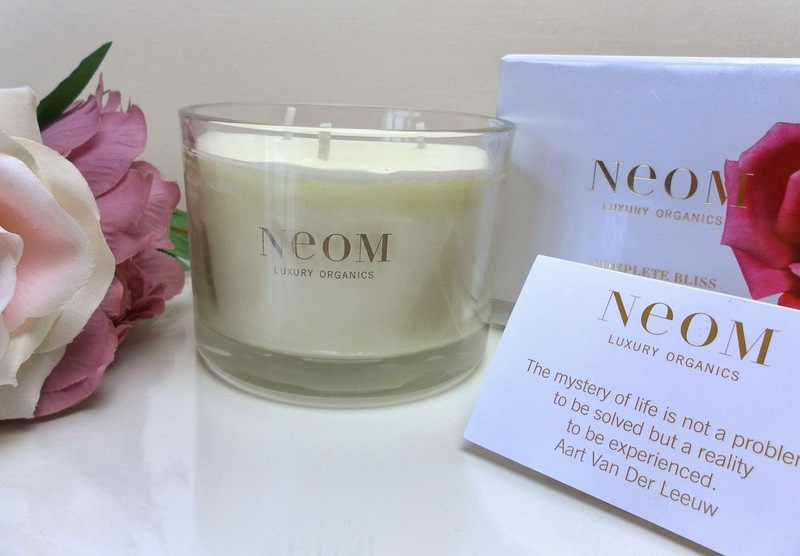 The perfect home scent, NEOM Complete Bliss would be a lovely treat to yourself, or even a perfect gift for Mother's Day. What's your favourite rose scented product? Favourite rose-scented product? Oh, that's a hard one, I have so many. Well, my Nuxe clarifying cream mask is on top of the list, followed closely by Sanctuary Spa's deep facial cleanser. I also liked the smell of Lush's Imogen Rose, though I haven't bought one of those. I need to stop reading reviews of these candles because it makes me want one so badly! I've not tried their products before. My favourite rose product is a beautiful hand cream that my job sharer leaves in the draw and I sneakily help myself to every now and then because it is divine! I need to write down the name of it and buy my own soon and gift her another too! If I wasn't so scared of knocking candles over, and setting my face on fire, my house would be full of them! !